To prepare this dish use a special container. Let fall 1 kg of wheat grain in large container and reduce the flour in small balls paying little above water and work it with motorcycle hands movement. add the flour with oil, salt and pepper, cinnamon, chopped onion, two bunches of parsley, and bay leaves that you put holes on the clay dish. 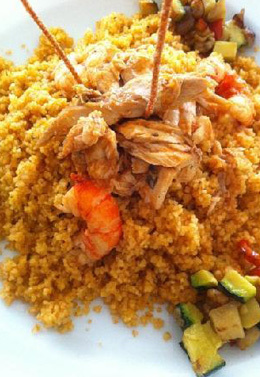 Cook the cous cous steam for about an hour and a half. Add, when water boils, various aromas (parsley, garlic, cloves) and some fish broth. Prepare a fish soup with 2 large onions fried, 2 litres of concentrated tomato, salt, pepper and a pesto made of garlic (some clove), two bunches of parsley and chopped 150 g almonds. Let cook for about 20 minutes and combined 1 kg of fish from broth. Put in a bowl part of the broth and fish (cut into small pieces) ready. add the cous cous with some 'broth filtered, and then cover everything with the cover with a wool blanket, let it rest for more than half an hour and serve, apart from the contents of the soup. In a mortar work the cloves of garlic, basil and almonds with salt and pepper. When you have got a cream add the pulp of the tomatoes in oil. Continue to crush to obtain a homogeneous mixture. Pour directly on pasta and garnished with fresh basil leaves and aged pecorino or Parmesan. 8 ripe tomatoes, 120 g. Toasted almonds, 3 cloves of garlic (1 per person), 2 bunches of fresh basil, olive oil, salt and pepper. 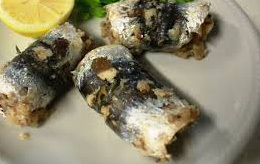 Take sardines boned, wash and dry them carefully with a cloth and put them in a bowl with a glass of vinegar. Let them marinate for 2 hours. Open them in a dish and put with cheese mixed with 2 cloves of garlic and a tablespoon of chopped parsley, salt and pepper. Close them between the palms of the hands and beaten add the salty and peppery, then turn in breadcrumbs and deep fry in hot oil, brown them on both sides. put away water well golden and serve with lemon slices, crisp and hot, or cold. This is first quality almond paste and sugar together with some water cinnamon. All baked in a tin-copper not to be forged, thanks to its smoothness, with his hands as if it were clay. 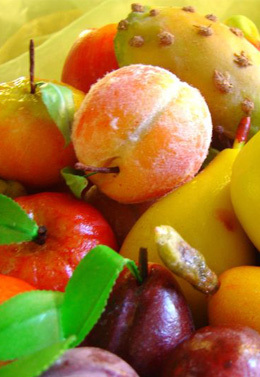 For this feature you can give sweet shapes and colors of objects of daily life, first of all fruit. Like a surreal "still life" dominated by almonds and sugar. Dissolve yeast with a pinch of salt and a little warm water, flour and add to work well with the addition of some other sip of lukewarm water, so that the dough is soft and elastic. Add a tablespoon of oil and just the pasta is ready, make a ball, wrap it in a napkin and leave by the dough for about an hour. Work it still put briefly and in a tin, previously greased spianandola with his hands. Dress with tomato peeled and torn to pieces, garlic, anchovy pieces, grated cheese, some oil, salt and pepper. 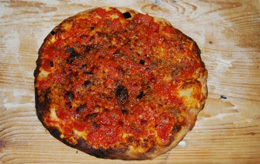 Cover of oregano in quantity and pass a hot oven. Chop almonds, walnuts and hazelnuts until they get chopped fine. Heat honey with 200 ml of wine; lowers-fire to a minimum and incorporate cookies crumbled, a pinch of nutmeg, a pepper and a cinnamon. Combine the chopped almonds, walnuts and hazelnuts, mix well and remove from fire. Joining the candies, raisins, pine nuts and Cognac. Leave to cool, then cover with a sheet of paper and let it rest until the following day. Prepare the dough: working meal with wine remained left at room temperature, oil, butter at room temperature, sugar and a pinch of salt. 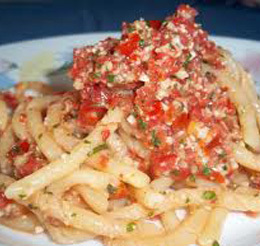 If during processing pasta should were too harsh, merge of wine. Roll out the puff pastry into a thin, and then get two discs of 28 cm in diameter and have one in a mould of 26 cm lined with paper oven. Fill the cake with the compound prepared the day before, cover with another disc and weld the edges well. Bake the cake at 180 � C and bake for half an hour. Remove cake from oven and allow to cool. Sprinkle with the powdered sugar and serve. Procedure: Boil rice with salt. 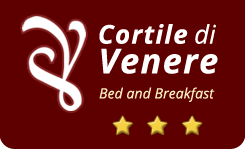 When cooked, mix the rice with sauce, grated cheese and three beaten eggs which act as a glue. Make balls of rice with pieces of the inside of egg hard, cheese, minced meat and peas. 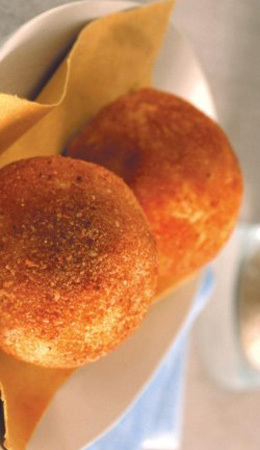 Go then arancina in 'beaten egg, then in the soft and finally fry in abundant oil. 1Kg rice; + Peas; + Boiled eggs; cheese +; + Sauce; + Minced meat; + Horse grated cheese. Take the flour and put lard in the centre with two egg yolks and mix with alcohol and wine to obtain a paste fairly consistent. Let rest a little pasta covered with a napkin (1-2 hours). Then extend a sheet thickness of 2 or 3 mm and cut circles in the puff diameter of 12 cm. About. Wrap each circle of dough in the appropriate torches. To ensure a good weld the two strips of pasta, cannoli then fry in plenty lard. When they are golden, put them over a blotting paper. Leave to cool and then off the cannoli by torches. Running Mix ricotta with sugar and pass the sieve because everything should be as a cream. 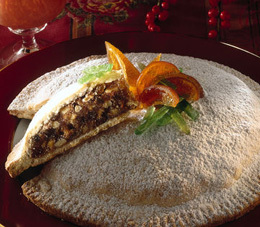 Add the candied fruit and chocolate and mix well. 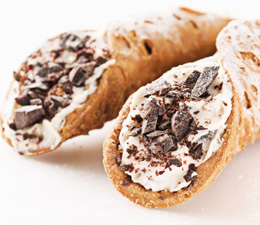 Fill cannoli, jogging both ends with the wet blade of a knife and decorate with toasted almonds. Finally sprinkle with powdered sugar. Pasta: 500 g. 00 of flour, two egg yolks, 25 g. Alcohol, 20 g. Of lard, wine (instead of wine and 'alcohol you can use red wine aged), lard for frying. Stuffing: sheep cheese, sugar, candied chopped, chocolate into pieces. Mix everything with ricotta with a spoon wood, but remember that most mix cheese sheep better is the end result, but without hand mixers, etc., add a few drops of rosolio. Now take a form, tailored, lean a sheet of paper from the kitchen with fruit jelly, put them around slices of pan Spain. Take everything as is and put it inside the refrigerator for about two hours. 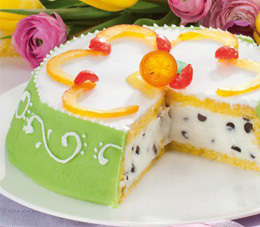 Then prepared a plate of pastry and cardboard put above cassata upside down. At this point, and it should be ready just decorate to your liking, 'dress' it with frosting and pistachio systematic candied fruit. Mix the flour with whole egg, a little grated lemon peel, the yeast diluted in a little warm water and add yet how much water will it take to obtain a compound elastic. put the mixture obtained in a napkin and let it rest for about 50 minutes. 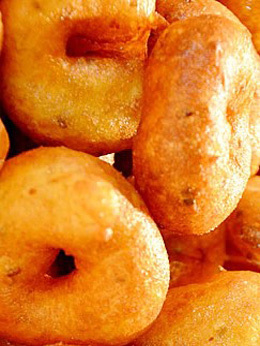 Cut the dough into pieces that have given the form of small flat doughnuts. Fry in plenty hot oil. Drain, sprinkled with powdered sugar and serve. Gr. 500 white flour, gr. 25 yeast, 3 eggs, Sicilian lemon, sugar to the veil, extra olive oil for frying.